Many people associate models with physical perfection, when in truth, the modeling industry caters to all kinds of body types. Often, the things that make a model look different than anyone else are credited with that model’s success (think Lauren Hutton’s gap smile, Iman’s neck, Cindy Crawford’s mole). However, most people have features they aren’t entirely comfortable with, and models or not, they may choose plastic surgery to give them the look they desire. For someone who isn’t a model, plastic surgery will generally have the greatest impact on their confidence and how they feel about themselves. For models, having plastic surgery (or not) can affect a lot more than that. In fact, it can make or break a modeling career. There are a few key things to consider if you’re thinking of getting plastic surgery and you also aspire to be a model or make changes to your existing modeling career. First and foremost, if you already have a modeling agent, it is paramount that you consult with your agent before making any changes. When you were signed with your agent, you were chosen for a reason. If you have surgery to alter your appearance, it can drastically change the type of jobs for which your look is appropriate. If the bump in your nose is something you want to be changed, your agent might say that’s a good idea, or they might say it’s a feature they like about your look. Similarly, some models choose to have their ears pinned back when their agent approves, or others are encouraged to leave them as they are. Changes like these likely won’t change the modeling industries you’re appropriate for, but there are certain changes that may ultimately exclude you from certain industries altogether. Breast implants are an especially important topic when it comes to modeling and plastic surgery, and here’s what you really need to know before you go under the knife. If you want to be a high-fashion editorial or runway model, getting breast implants can limit your opportunities in that department. For fashion designers, the most important thing they consider is how their designs will look in magazines and on the runway. They don't want anything that will change the line or silhouette of their designs or distract from the look they are trying to achieve. If you’re determined to be a model and have or want to get breast implants, you must know in advance it may limit you to commercial, glamour, swimsuit and lingerie modeling. Before making any decisions, you must speak with your agent, or you risk them dropping you or losing out on great career opportunities. 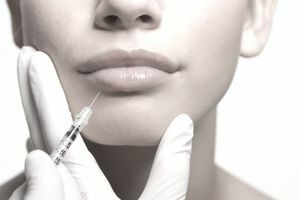 Several models admit to using Botox or fillers in the lines on their face, or to plump their lips. Usually, it is more mature models who claim to do this, however, it isn’t uncommon for women in their twenties to do so as well. Models need to be careful when considering this kind of work as it can limit their facial movements and make them less expressive. As with other procedures, make sure you discuss Botox and fillers with your agent before getting poked! Of course, if you are inherently against getting plastic surgery and are being pressured to do something that makes you very uncomfortable, it is your right to refuse it. It is also important to keep in mind that you don’t need plastic surgery to be a model, but it may benefit you in certain industries, just as it may work against you in others. What’s most important is your health and safety, which is why the guidance of a modeling agent will be very helpful as you make these decisions.